Earthquake can change underground stress condition around the hypocenter and affect the fracture systems of the rocks. 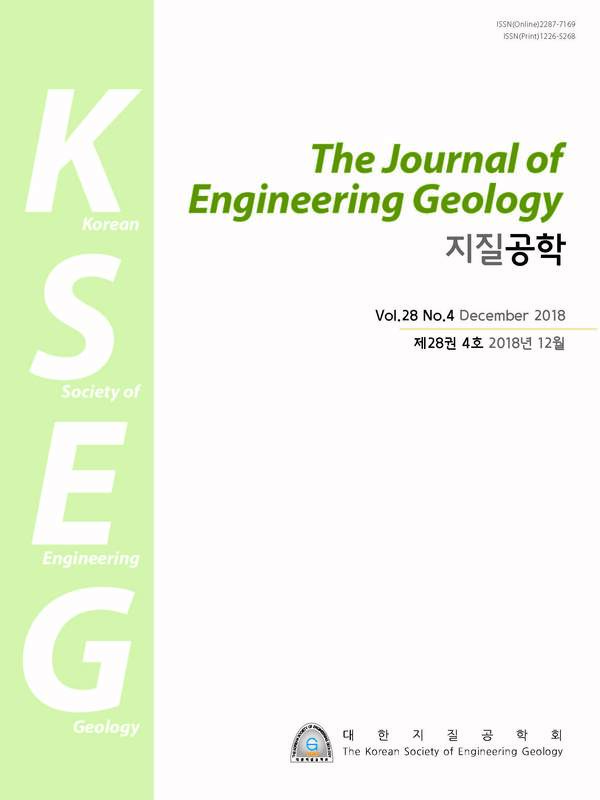 In Korea, the M5.8 Gyeongju earthquake on September 12, 2016 and M5.4 Pohang earthquake on November 15, 2017 occurred inside the Yangsan fault zone and possibly affected the fracture systems in the Yangsan fault zone and nearby rock masses. 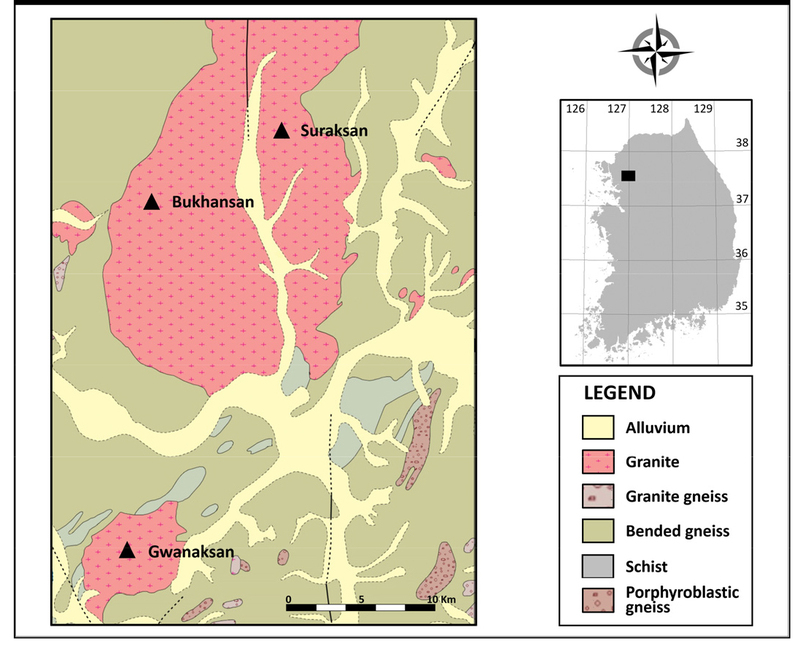 In this study, the characteristics of the fracture system (fracture orientation, number of the fractures, fracture spacing and aperture, dip angle, fracture density along depth, and relative rock strength) of the rocks in the low/intermediate level radioactive waste repository site located in the coastal area of the East Sea are analyzed by the impact of the Gyeongju and Pohang earthquakes using acoustic televiewer data taken from the boreholes at the radioactive waste repository site in 2005 and 2018. As a result of acoustic televiewer logging analysis, the fracture numbers, fracture aperture, and fracture density along depth overall increased in 2018 comparing to those in 2005. This increase tendency may be due to changes in the fracture system due to the impact of the earthquakes, or due to weathering of the wall of the boreholes for a long period longer than 10 years after the installation of the boreholes in 2005. In the borehole KB-14, on the whole, the orientation of the fractures and the average fracture spacing are slightly different between 2005 and 2018, while dip angle and relative rock strength in 2005 and 2018 are similar each other. 지진은 진원지 주변의 지반의 응력상태를 변화시키고, 암반의 단열계에 영향을 미칠 수 있다. 국내에서 2016년 9월 12일과 2017년 11월 15일에 각각 발생한 지진규모 5.8의 경주지진과 지진규모 5.4의 포항지진은 양산단층대와 관련되며, 양산단층대 및 인근 지역 암반의 단열계에 영향을 미쳤을 가능성이 있다. 본 연구에서는 동해안 지역에 위치하는 중 ‧ 저준위 방사성폐기물 처분장 부지 내 암반의 단열계 특성(방향성, 주향에 따른 절리개수, 절리간격, 절리간극, 경사각, 심도 구간별 절리빈도, 상대 암반강도)이 경주지진 및 포항지진에 의해서 영향을 받았는지를 분석하기 위하여 부지내 감시공에서 2005년과 2018년에 실시한 초음파 주사검층자료를 비교·분석하였다. 초음파 주사검층 분석 결과, 주향에 따른 절리개수, 절리간극, 심도 구간별 절리빈도는 2005년보다 2018년에 대체로 증가하였다. 이러한 증가는 지진의 영향으로 인한 단열체계의 변화로 인한 영향이거나, 2005년 감시공 설치 이후 10년 이상의 오랜 기간 나공 상태에서 공벽의 풍화로 인한 것일 수도 있다. 또한 KB-14공에서 전체 절리의 방향성과 절리의 평균 간격이 2005년과 2018년 사이에 다소 차이를 보이고 있으나, 절리면 경사와 상대 암반강도는 전반적으로 2005년과 2018년이 유사하게 나타났다. The rainfall intensity-duration curve (I-D curve) was used for selecting the dredging time of sediments behind a debris barrier which is located at the study area in Inje-gun, Kangwon Province. The I-D curve was newly suggested by using the data of rainfall-induced landslides for about 30 years from June to September in Kangwon Province. According to the monitoring results, the landslides have been not occurred during the monitoring period of the dredged sediments management system at the study area, and also all of the rainfall events were located below the I-D curve. The weight of the dredged sediments measured at the management system in the field was increased but the weight increment was small. It means that the increase of the dredged sediments was not the effect of landslide but the effect of soil erosion at the ground surface due to heavy rainfall. The weight of the dredged sediments behind a debris barrier could be known in real time using the rainfall data measured at the management system. Also, when the I-D curve is used with the management system, it is possible to select the optimum dredging time for sediments behind debris barrier. 준설퇴적물 관리시스템이 설치된 사방댐(강원도 인제군)을 대상으로 강우강도-강우지속시간 한계곡선(I-D curve)을 이용하여 사방댐 배면의 퇴적물에 대한 준설시기를 선정하였다. 강원지역에서 약 30년 동안 6-9월 사이의 집중호우로 발생된 산사태 자료를 이용하여 I-D curve를 제안하였다. 준설관리시스템의 운영기간 동안 연구지역에서는 산사태가 발생되지 않았으며, 모든 강우사상은 I-D curve 아래에 위치하고 있다. 준설퇴적물 관리시스템에 대한 모니터링 결과 준설퇴적물 관리시스템에서 측정된 준설퇴적물 하중은 증가양상을 보였으나 증가량은 적은 것으로 나타났다. 따라서 준설퇴적물의 증가는 산사태에 의한 것이 아니라 집중호우시 산지표층부에서 발생된 일부 토사유실에 의한 것임을 알 수 있다. 준설퇴적물 관리시스템에 설치된 강우자료를 활용하여 사방댐 배면 준설퇴적물의 양을 실시간으로 확인할 수 있으며, 강우 한계곡선(I-D curve)을 함께 활용할 경우 사방댐 배면의 퇴적물에 대한 최적의 준설시기 선정이 가능하게 된다. Landslides occur due to heavy rainfall in the summer season. Some of water may infiltrate into the ground; it causes a high saturation condition capable of causing a landslide. Soil properties are crucial in estimating slope stability and debris flow occurrence. The main study areas are Gwanaksan, Suraksan and Bukhansan (Mountain) in Seoul. 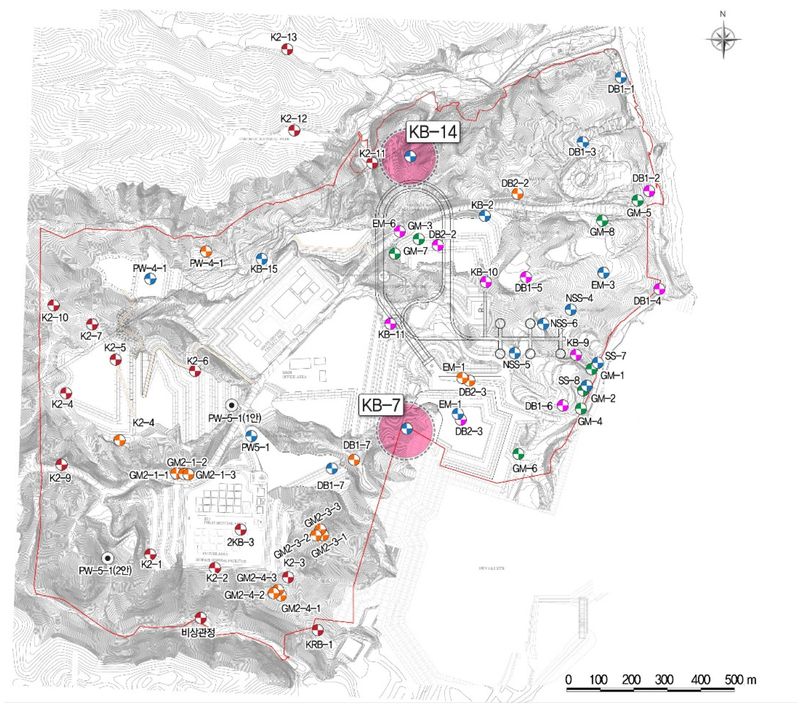 A total of 44 soil samples were taken from the study area; and a series of geotechnical tests were performed. 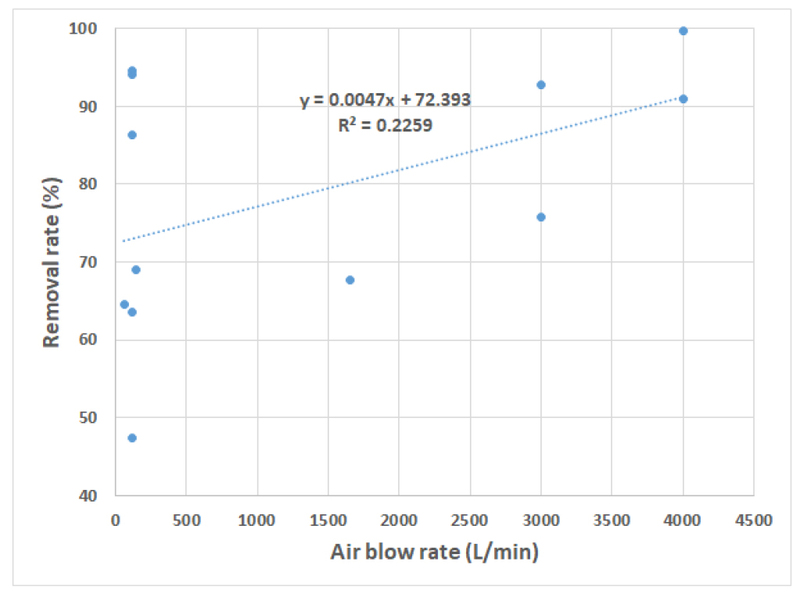 Physical and mechanical properties were obtained and compared based on region. As a result, among well-graded soils, they are classified as a clayey sand. Coarse-grained and fine-grained contents are approximately 95% and 5%, respectively, with very low amount of clay content. Density, liquid limit and dry unit weight are ranged in 2.62~2.67 g/cm3, 27.93~38.15% and 1.092~1.814 g/cm3. Cohesion and internal friction angle are 4 kPa and 35° regardless of mountain area. Coefficient of permeability is varied between 3.07×10-3~4.61×10-2 cm/sec; it means that it results in great seepage. Permeability is inversely proportional to the uniformity coefficient and is proportional to the effective particle size. In the formal case, there was a difference by mountain area, while in the latter, the tendency was almost similar. 우리나라의 경우 자연사면에서 발생되는 산사태는 대부분 여름철의 집중호우에 기인되며 주로 토층지반에서 발생된다. 집중호우로 인해 자연사면의 토층지반이 포화되고 지반지지력이 약화되어 사면붕괴 가능성이 높아진다. 사면안정성과 토석류 확산성 평가시에는 지반의 토질특성 분석이 필수적이다. 본 연구는 서울지역 주요 산지 관악산, 수락산과 북한산에 분포한 화강암토층지반을 대상으로 총 44개소에서 시료를 채취하여 물리·역학적 특성에 관한 지반공학시험을 통한 토질특성을 분석하였다. 그리고 산사태 발생 유발인자와 관계되는 토질의 물성과 공학특성을 산지별로 구분하여 대비하고 토질물성 간의 상관성을 분석하였다. 시험분석 결과에 따르면, 연구대상지역의 토층은 전반적으로 양호한 입도의 모래 또는 점토질모래로 분류할 수 있다. 특히 조립토와 세립토 함유율이 각각 95%와 5%로 대부분 산지에서 점토함량이 매우 낮으며, 모래를 다량 함유한 토층지반으로 나타났다. 밀도, 액성한계, 그리고 습윤단위중량은 각각 2.62~2.67 g/cm3, 27.93~38.15% 및 1.092~1.814 g/cm3인 것으로 나타났다. 점착력과 내부마찰각은 각각 4 kPa 및 35°로서 산지별 큰 차이가 없었으며, 투수계수는 3.07×10-3~4.61×10-2 cm/sec로서 보통~빠른 정도의 투수성지반으로 평가되었다. 투수계수는 균등계수와 반비례적 관계이고, 유효입경과는 비례적인 관계로 나타났다. 투수계수와 균등계수 관계식은 산지별로 다소 차이를 보이는 반면, 투수계수와 유효입경은 산지별로 거의 유사한 경향성을 보였다. It is possible that radon removal in groundwater of small-scale water supply system (SWSS) is caused by atmospheric storage and aeration facilities installed in the water tank. Radon removal rates at water tank and tap of the 32 SWSS during summer season ranged from -69.3% to 62.7% (average 25.7%) and from -64.3% to 83.1% (average 30.3%) while those of 16 SWSS during autumn season ranged from 21.3% to 78.0% (average 42.8%) and from 17.7% to 66.9% (average 44.8%). The reason of higher radon removal rate in the autumn season compared with the summer season is due to higher atmospheric storage effect by lower groundwater use rate. The radon removal rates at the water tank from 12 SWSS were 47.4∼94.0% (average 78.9%), in which the removal rates at the atmospheric storage are also included. Atmospheric storage and aeration can be used to reduce radon concentration in SWSS groundwater. For more efficient use of radon reduction, further studies are necessary to assess the radon removal rate considering variation conditions of radon concentration in groundwater, size and forms of water tank, change in groundwater usage rate, aeration capacity and ventilation facilities. 지하수를 원수로 이용하는 소규모수도시설의 라돈 저감은 주로 저수조에서의 정치와 폭기에 의해 일어난다. 여름철 정치에 의한 32개 소규모수도시설 저수조와 꼭지수의 라돈 저감율은 -69.3∼62.7%(평균 25.7%)와 -64.3%∼83.1%(평균 30.3%), 가을철 정치에 의한 16개 소규모수도시설 저수조와 꼭지수의 라돈 저감율은 21.3%∼78.0%(평균 42.8%)와 17.7%∼66.9%(평균 44.8%)로 나타났다. 여름철보다 가을철의 라돈 저감률이 더 높은 것은 가을철의 지하수 사용량이 더 적어서 정치효과가 더 컸기 때문으로 판단된다. 폭기시설이 설치된 12개 저수조의 라돈 저감률은 47.4∼94.0%(평균 78.9%)로 나타났는데 이 저감률에는 정치에 의한 라돈 저감률이 합쳐져 있다. 소규모수도시설 지하수의 라돈 저감을 위해서는 정치와 폭기를 이용할 수 있는데 보다 효율적인 활용을 위하여 지하수의 라돈 함량 변동성, 저수조의 크기와 형태, 지하수 사용량 변화, 폭기량, 환기시설 등을 고려한 라돈 저감 연구가 필요하다. This study performs to evaluate adaptability of seashore filtering type seawater-intake which adapts dua1 filter well alternative for direct seawater-intake. This study varies filter condition of seashore free surface aquifer which is composed of sand layer then installs real size dual filter well and single filter well to evaluate water permeability and proper pumping amount according to filter condition. According to result of step aquifer test, it is analysed that 110.3% synergy effect of water permeability coefficient is happened compare to single filter since dual filter well has better improvement. dual filter has higher water permeability coefficient compare to same pumping amount, this means dual filter has more improved water permeability than single filter. 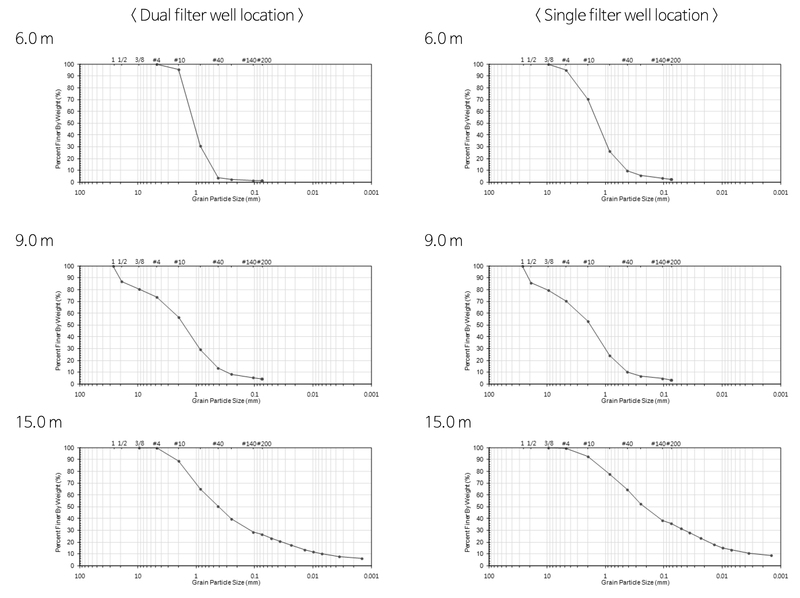 According to analysis result of continuous aquifer test, it is evaluated that dual filter well (SD1200) has higher water permeability than single filter well (SS800) by analysis of water permeability coefficient using monitoring well and gauging well, it is also analysed dual filter has 110.7% synergy effect of water permeability coefficient. As a evaluation result of pumping amount according to analysis of water level dropping rate, it is analysed that dual filter well increased 122.8% pumping amount compare to single filter well when water level dropping is 2.0 m. As a result of calculating proper pumping amount using water level dropping rate, it is analysed that dual filter well shows 136.0% higher pumping amount compare to single filter well. It is evaluated that proper pumping amount has 122.8~160% improvement compare to single filter, pumping amount improvement rate is 139.6% compare to averaged single filter. In other words, about 40% water intake efficiency can be improved by just installation of dual filter compare to normal well. Proper pumping amount of dual filter well using inflection point is 2843.3 L/min and it is evaluated that daily seawater intake amount is about 4,100 m3/day (≒4094.3 m3/day) in one hole of dual filter well. Since it is possible to intake plenty of water in one hole, higher adaptability is anticipated. In case of intaking seawater using dual filter well, no worries regarding damages on facilities caused by natural disaster such as severe weather or typhoon, improvement of pollution is anticipated due to seashore sand layer acts like filter. Therefore, It can be alternative of environmental issue for existing seawater intake technique, can save maintenance expenses related to installation fee or damages and has excellent adaptability in economic aspect. The result of this study will be utilized as a basic data of site demonstration test for adaptation of riverside filtered water of upcoming dual filter well and this study is also anticipated to present standard of well design and construction related to riverside filter and seashore filter technique. 국내에서는 바닷가 주변의 상가나 수협 등의 활어 위판장 등에 많은 양의 해수가 사용되고 있다. 이러한 해수는 기상악화나 태풍 등에 의해 관련시설이 수시로 파손되고 조기 폐색되어 시간적, 경제적 비용이 많이 소요되고 있는 실정이다. 또한 오염된 해수가 그대로 유입되는 경우가 많아 환경적인 문제를 야기하기도 한다. 본 연구는 직접적인 해수취수의 대안으로 이중필터취수정을 적용한 해변여과 방식의 해수취수 적용성을 평가하고자 수행하였다. 본 연구에서는 토층으로 이루어진 해변의 자유면대수층에서 필터조건을 달리하여 실규모의 이중필터취수정과 단일필터취수정을 각각 설치하고 설치된 우물에서 단계 및 연속대수성시험을 실시하여 필터재 조건에 따른 투수특성 및 적정양수량을 평가하였다. 단계대수성시험 분석결과 이중필터 취수정에서 우물 개량의 정도가 양호하여 단일필터 대비 110.3%의 투수계수 상승효과가 발생하는 것으로 분석되었다. 동일 양수량 대비 이중필터의 투수계수가 높게 나타나며, 이는 이중필터가 단일필터에 비해 투수성이 개선된 영향으로 판단된다. 연속대수성시험 분석결과 관측정 및 양수정을 이용한 투수계수 분석에서 이중필터취수정(SD1200)이 단일필터취수정(SS800)에 비해 높은 투수특성을 나타내는 것으로 평가되었으며, 이중필터가 단일필터 대비 평균 110.7%의 투수계수 상승효과가 발생하는 것으로 분석되었다. 수위강하량 분석을 통한 양수량 평가결과, 수위강하 2.0 m일 때 이중필터 취수정이 단일필터 취수정 대비 122.8% 양수량이 증대되는 것으로 분석되었으며, 비수위강하량을 이용하여 적정양수량을 산정한 결과 이중필터취수정이 단일필터취수정에 비해 136.0% 높은 양수량을 보이는 것으로 분석되었다. 또한 변곡점을 이용한 양수량 평가결과 이중필터가 단일필터에 비해 160.0% 높은 적정양수량을 보이는 것으로 분석되었다. 적정양수량의 경우 분석방법에 따라 단일필터 대비 122.8~160.0%의 개선효과가 있는 것으로 평가되었으며, 이를 평균한 단일필터 대비 이중필터의 양수량 개선율은 139.6%이다. 즉, 이중필터 설치만으로 일반적인 우물 대비 취수효율이 40% 정도 개선될 수 있음을 확인하였다. 변곡점을 이용한 이중필터취수정의 적정양수량은 2843.3 L/min로써 이중필터취수정 단일공의 일 해수취수량은 약 4,100 m3/day (≒4094.3 m3/day)에 달하는 것으로 평가되었다. 이와 같이 공당 다량의 취수가 가능하기 때문에 해수취수의 적용성이 높을 것으로 기대된다. 또한 이중필터취수정을 이용하여 해수취수를 수행하는 경우 기존에 문제시되었던 기상악화나 태풍 등에 의한 파손우려를 해소할 수 있으며, 해변의 모래층이 필터재 역할을 하여 오염정도를 개선하는 효과가 있을 것으로 기대된다. 따라서, 기존 해수취수기술에 대한 환경적인 문제 해결의 대안이 될 수 있고, 설치비용 및 파손등과 관련된 장기적인 유지관리비용 면에서도 유리하여 경제적 측면에서 그 적용성이 매우 높을 것으로 판단된다. 본 연구의 결과는 추후 수행예정인 이중필터취수정의 강변여과수 적용을 위한 현장실증시험의 기초자료로 활용될 예정이며, 그 결과를 종합하여 강변여과 및 해변여과기술과 관련된 우물의 설계 및 시공에 대한 표준화된 기준을 제시할 수 있을 것으로 기대된다.